I have heard many people that they are not able to connect to Wi-Fi after the Android Marshmallow update in their phone. Android Marshmallow comes with many new features such as native support for the Fingerprint sensor and has a Doze mode which reduces battery usage while your phone is in Sleep mode. Another new feature is Google Now on Tap which can help you to search for a word or sentence in Google just by tapping on it. Android Marshmallow uses new Android DHCP client due to which many users are not able to connect to their old Wi-Fi network or sometimes they need to disconnect and reconnect to the Network for obtaining an IP address. 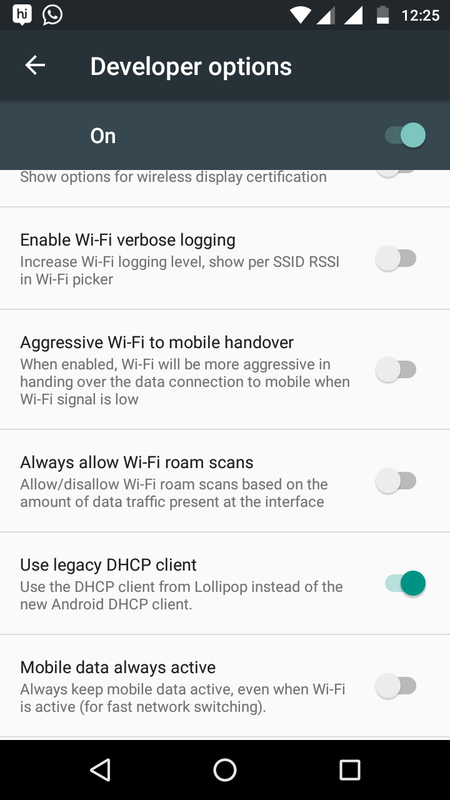 If you are not able to connect to Wi-Fi after the marshmallow update, then you can use legacy DHCP client in the Developer options which uses the old Lollipop DHCP client. To enable Developer options, go to Settings> About and find build number then tap it 5-7 times which will enable developer option in the Settings Menu. In Settings> Developer options search for “Use legacy DHCP client” under Networking and enable it. There are also many other options if the above method doesn’t work. In Settings> Wi-Fi and go to options then select Saved networks and tap on network which you are trying to connect and then tap on forget. Now again try to connect and Login to you Wi-Fi Network. Also check the router’s Wi-Fi setting. Use a proper decimal or hexadecimal password for securing your Wi-Fi network. If the problem, persist then contact your router’s manufacturer for the problem. Android Marshmallow is currently running on about 13% devices as of June 2016 and many other devices will be getting this update in the coming weeks however Android 5.1 has a biggest share in the Android Smartphone industry. In couple of weeks Android 7.0 Nougat is going to roll out for the Nexus smartphones with many features like Split screen, Direct reply from the notification, full width notification panel and much more. There is also rumor of a modified Google launcher for Nexus devices. Google is going to launch its new Nexus devices soon code named as ‘MARLIN’ and ‘SAILFISH’ which are manufactured by HTC. Google has also started the Developer Preview program for its Nexus 5X, Nexus 6 and Nexus 6P smartphones. We have also heard that Nexus 5 users will not be updated to Android Nougat.